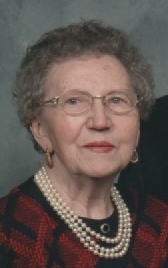 Hallie M. Anderson, 97, of Littlestown, died Sat., March 23, at Hanover Hall. She was the widow of Aleck J. Anderson who died July 7, 2009. Born Jan 24, 1922 in Mt. Airy, MD, Hallie was the daughter of the late Samuel & Jesse (Snyder) Hoffman. She was a homemaker and farmer. Surviving are her son Richard A. Anderson & Linda of San Antonio, TX; her daughter Shirley L. Anderson of Carlisle; her grandchildren Mark Anderson and Karen Miller; 4 great grandchildren and her sister Betty Lambert of Westminster. Hallie was predeceased by her son Ronald S. Anderson; her brothers Paul, George & Rudell Hoffman and her sister Ruth Thompson. She was a member of St. John’s Lutheran Church, Littlestown. Hallie loved animals and flowers and enjoyed gardening and being outside. It is with great heartbreak that we are missing a wonderful part of our family. Aunt Hallie was a remarkable woman to know in our lives. We were truly blessed to know her and love her. Prayers and love to our extended family.